Sometimes history is ugly and sometimes historical figures are villainous. Such is the case of Rasputin, also known as the "Mad Monk", who brought down the Romanov family (the last Tsar of Russia) by association. Rasputin's Daughter , by Robert Alexander is most definitely not for the faint of heart. 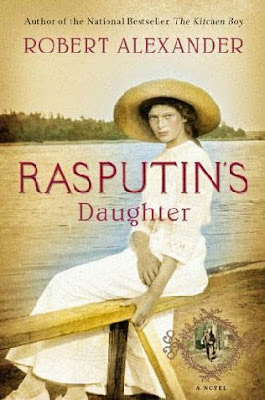 After reading The Kitchen Boy (linked to my review of love and adoration) I was informed that Alexander wrote some additional titles surrounding the Romanov family - one of which is, of course, Rasputin's Daughter . It didn't take me too long to track down a copy for myself and I launched into it eagerly. Once again, I was spell-bound from page one and couldn't pry my eyes away from the pages even though I occasionally thought I should try. While The Kitchen Boy was fascinating and delightful, (such that I'm still convinced it's probably going to rank as one of my top favorite books read in 2011), Rasputin was fascinating in a horrid and awful way. I knew Alexander took great care and pains to be as historical accurate as possible with this work. Just like he did in his first novel about this royal family, he used actual pieces of correspondence and historical facts to weave his fiction around. What Alexander purposes to do is offer an alternative "what if?" side to the Romanov family and those surrounding them. In this particular story, Alexander focuses on Grigori Rasputin who endeared himself to Tsar Nicolas and his wife the Tsarina, Alexandra, by "performing" acts of healing on their hemophiliac son, the heir to the throne. Rasputin does have a colorful background, being known as a womanizer from a very young age. He was from a small village in Siberia and married a local woman (who refused relations with him until he promised to marry her - so he did) but still prowled around. The village wanted him to move away and take his family with him. Instead, he agreed to walk to and spend time in a monastery. While there he "found God" (I suppose) and became more spiritually minded. He was noted to have a gift of second sight and a gift of healing. I think that either one cannot be disputed because he clearly gave many examples of healing throughout his lifetime. He had very intense eyes which people said were very persuasive and helped him, as a peasant, rise to the position of having a relationship with the Romanov's. Rasputin also had a false idea of salvation and God Himself. Rasputin believed that to come to God one must first sin terribly. After sinning, then you could be redeemed. He seemed to ignore the fact that we were all born in sin and conceived in sin and sin isn't something that any one of us really need to work on perfecting. (Ps. 51:5) We come to a gracious and merciful God because we are sinners from birth, not because we've developed a knack for it. Still, he managed to convince many women that he could help them sin first and then receive sanctification. Your own imagination can likely fill in the blanks there. I'm also fascinated by this character (if I can use that word) because I think he is a prime example of how "bad company corrupts good morals." 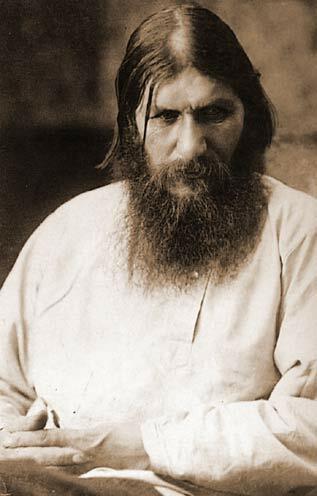 The people of Russia distrusted Rasputin and his proximity to the throne. They did not care to see a peasant like themselves rise in the eyes of royalty and influence things to the degree that he most definitely did. Call it jealousy if you like, or great distrust. (Personally I just wouldn't have trusted him! He did spark a great number of rumors and I rather believe most were true.) The Book of Proverbs gives many warnings against making friends with evil people and keeping close company with those who do not follow after God. (Proverbs 12:26; Proverbs 13:20; and 1 Corinthians 15:33) If you are a Christian, then your desire to surround yourselves with faithful Christians should be strong. I believe that Alexandra was too desperate over her son's health that she tossed her better judgment aside and gave Rasputin a foothold which, not only did he not deserve, but ultimately brought about the people's distrust in their Tsar and resulted in the Romanov's family's own vicious murders. Bad company will drag you down with them. We must choose our company wisely and well and rest assured that there will always be consequences for our choices and actions. Although this book is shocking and horrifying on a great many levels, I also found it historical appealing and a good study on why it is important to select wise and faithful companions on our life journey. I'm glad to have read Rasputin's Daughter , but I also hesitate to recommend it. It's not a clean read but that's because it is a work about a real life unclean person. I don't think Alexander over dramatized anything about Rasputin at all. He painted a rather good picture of the man and so it is an interesting study, if you will, in piecing together more of the last Tsar of Russia and his curious and famous family. Definitely read The Kitchen Boy but think twice before you pick up Rasputin's Daughter . Or, at the very least, just be aware that it doesn't paint a pretty picture. Then again, much of history isn't pretty so I wouldn't go about expecting a neat and tidy story all of the time. There is much to be learned both in the good and the bad of the past - if we'll pay attention to it and be willing to learn from it. What a creepy guy! I'm glad you researched him and not me. EEE...ick. But you do make it sound good, though, and well worth the read...esp since it is true to history. I have put The Kitchen Boy on my list. Interesting post. It's so true that history isn't pretty. I was recently reading about two missionary families returning from Africa during WW II whose ship had just been sunk by a German submarine. Some family members spent several weeks on a life raft; some drowned. Obviously, some people survive (or the book wouldn't have been written) but the story is not all "enjoyable". well-written review. I fully agree, we sinful humans aren't "pretty", and sometimes we can learn from the mistakes of others. As a sidenote, I am particularly struck by your reference to carefully choosing our companions. This topic sure seems to be popping up every time I turn around here lately! That's one of those names I've heard somewhere -- probably an old history class -- but knew relative nothing about. I think this is plenty. :-) I doubt I'll pick up this book, but I appreciate your review and your applications. Very interesting, I didn't know much about him. I LOVE reading about the Russian Revolution and all that surrounds it! This was one of my favorite time periods to teach when I taught world history. I'll look these books up sometime! This really doesn't sound like my kind of book, but I went and read your review of the Kitchen Boy and that does sound interesting...especially if it's been well researched.